Wetlands are transitional areas between land and water. 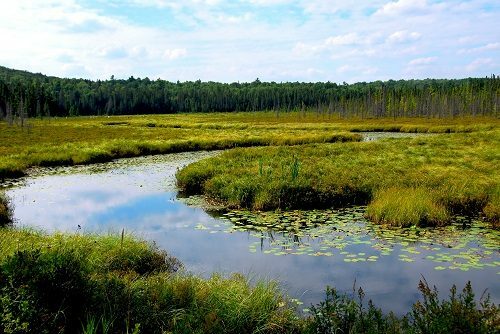 There are many types of wetlands, including bogs, freshwater and saltwater marshes, swamps, meadows, and floodplains. Many of these areas are forested. They differ from lakes, rivers, and oceans because they are defined as areas having, at least periodically, waterlogged soils or standing water. 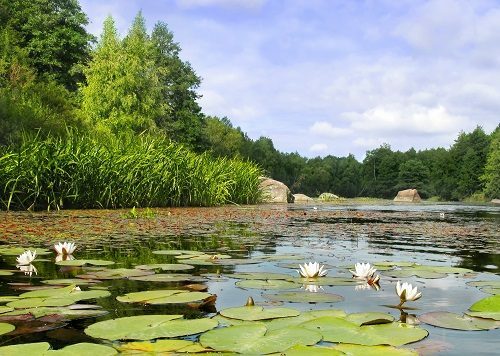 Though often overlooked, wetland environments are very important to people and wildlife. They reduce flooding, provide natal filtration for sediments and pollutants, and create viable habitat for many species. Below are some ideas to engage middle school students in STEM as they explore wetlands and learn about why they are important. These enrichments accompany Activity 71, Watch on Wetlands found in Project Learning Tree’s PreK-8 Environmental Education Activity Guide. Be sure to check out the full lesson! Essential Question: Why are wetlands important? Identify and explore a wetland close to your home, school, or in your community. Describe benefits that this wetland provides—considering not only human, plant, and animal species—but also to communities and economies, both large and small. MS-LS2-5. Ecosystems: Interactions, Energy, and Dynamics – Evaluate competing design solutions for maintaining biodiversity and ecosystem services. MS-ESS3-3. Earth and Human Activity – Apply scientific principles to design a method for monitoring and minimizing a human impact on the environment. MS-ETS1-2. Engineering Design – Evaluate competing design solutions using a systematic process to determine how well they meet the criteria and constraints of the problem. There are three components of a wetland – water, soil, and organisms that have adapted to thriving in water (or wet soil). Wetlands function like a giant sponge, slowly absorbing and releasing water over time. Wetland soils are referred to as hydric soils, meaning that the spaces between soil particles are filled with water. Hydric soils are also anaerobic (without oxygen). How have adaptations, such as the ones listed above, helped hydrophytes to thrive in wetland areas? If possible, find a microscope and view both sides of the water lily leaf. What do you see? Compare this to a leaf of a tree. Describe the differences. Using the U.S. Fish & Wildlife Service’s Wetlands Mapper, identify a wetland in your community. Take the time to learn how to maximize your use of the Wetlands Mapper using this helpful instructional video. Plan a visit to more closely investigate the wetland area near you. Describe the many ways in which this wetland benefits you and your community. Make a list of the species of wildlife (insects, birds, amphibians, reptiles, mammals) and plants (trees, grasses, mosses, ferns) you observe in and around the wetland. We know that wetlands help to slowly filter the water that moves through them. In fact—wetlands work so well to purify water—that communities have built artificial wetlands (called constructed wetlands) to filter waste water. Constructed wetlands represent an engineered ecosystem that can be built anywhere, including adjacent to housing communities. Each design has its own advantages and disadvantages. Learn about each design and select the optimal design to treat waste water from your school or home. The Stallard Wetland is a beautiful 57-acre natural ecosystem. The primary function of this wetland is flood control for Irwin Creek, which happens to also be the primary supply of drinking water. Stallard Wetland is known for its great fishing and hunting. Numerous hiking trails crisscross up and down Irwin Creek and around Stallard Wetland, and this area is a hotspot for biodiversity. The City Council is concerned that Stallard Wetland is not worth protecting. Your job is to justify the value of the wetland to the City Council. 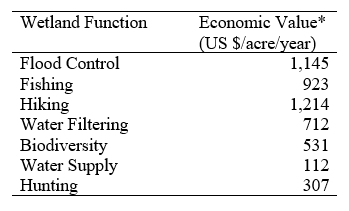 Based on the functions listed in the scenario above, calculate the total value Stallard Wetland using the per acre estimates in the table below. 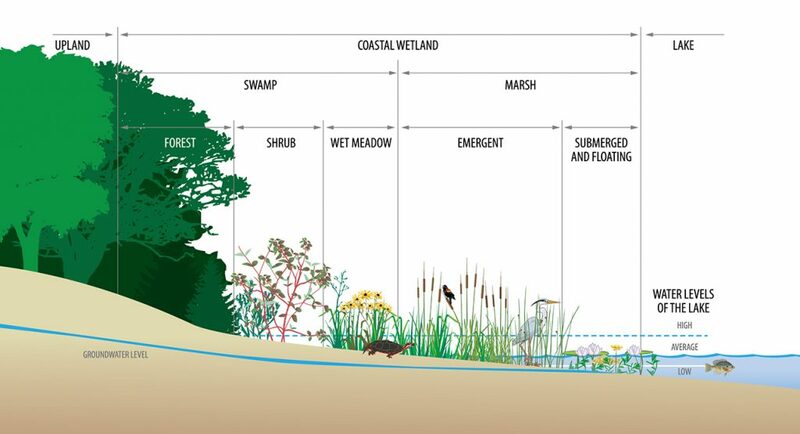 *Guidance on ecosystem valuation was modified from information presented in World Wildlife Fund’s Living Waters: Conserving the source of life; The Economic Values of the World’s Wetlands publication, which is available online as a PDF. Accessed May 23, 2018.
i thank my college for the input on a topic still being redesign as technology and more case examples are taken into account; no wetland obeys a role but still they all have certain common features that make them unique and interesting. i still venture into trying to learn about such aquatic environments tracking them when possible from its early geological beginnings and origins. The Colorado lower delta and the San Pedro Martir river systems and watersheds, in the highlands of the Baja California, have been my predilection almost for more than I can remember. again amigo thanks for your valuable information and materials, i will read some more and re think how to engage them with the groups i work with saludos Don Pigo.